We are web software consultants. Here we share some of our techniques. gspread is a high-level tool kit for accessing Google Sheets from Python. It makes it really easy to manipulate spreadsheets if you have the username and password to get into them. 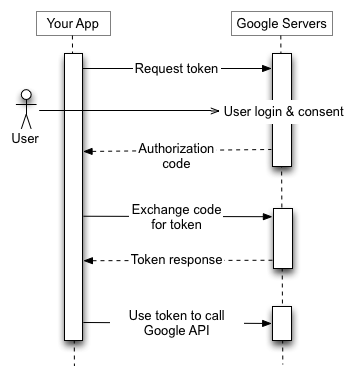 Unfortunately, its documentation for OAuth access does little more than tell you to read Google's manuals. If you have small experience with OAuth, this can be a big problem. This tutorial should get you going quickly, as long as you already have Python running in Ubuntu. Everything is explained step by step. You can get the code from gspread_HelloOAuthWorld on GitHub. Note that that OAuth has several versions and numerous distinct sequences of operations for different purposes and circumstances. One of the trickiest parts of learning OAuth is that different authors use different terminology to refer to the same sequence or they simply fail to clarify which sequence or version they're talking about. authenticate and authorize yourself to use your own GMail account as a mail transfer service for your Python programs. It uses the OAuth sequence described in Using OAuth 2.0 for Web Server Applications. get a third-party to authorize you to access their Google Sheets. It uses the OAuth sequence described in Using OAuth 2.0 for Devices. 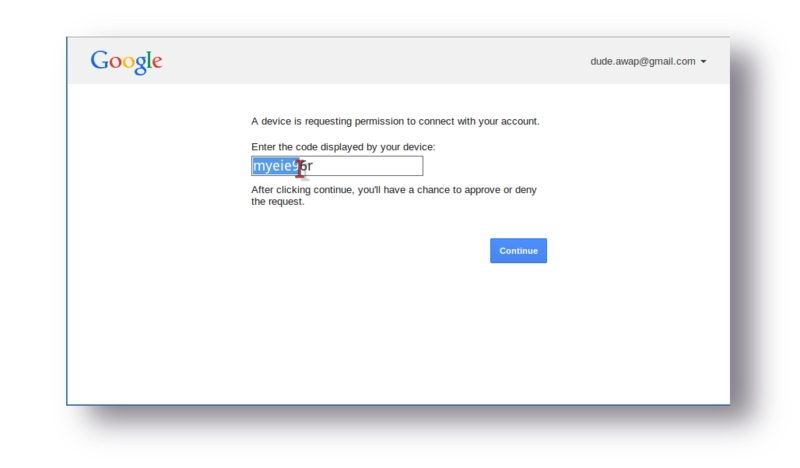 It prepares and displays a URL that includes a request token, and then prompts you to enter an authorization code. When you open the URL in a browser, you will need to log in to Google (if you haven't done so earlier) and consent to the indicated permissions. You then copy the resulting code back into the command line of authorize_SMTP.py. It will write to disk a file called "working_parameters.py", which, when imported into any other Python program, will provide access and refresh tokens for using GMail as an SMTP mail transfer service. It connects to Google and obtains a URL and authorization code specific to Google Sheets, then prepares an email and sends it to the individual you specify. The text of the email explains to them the purpose of the authorization code and provides a hyperlink to the authorization page. They simply have to copy and paste the provided code into the field presented at that URL, and then consent to the indicated access permissions on Google Sheets. Meanwhile, from the moment it sends the email, request_authorization.py sits in a slow loop waiting for 30 minutes, for your user to react. If they do indeed authorize you, it will prompt you to enter the URL of one of their Google Sheets workbooks. It then writes two files to disk: a new credentials file called "creds_oa.py", and an executable Python script "gspread_HelloOAuthWorld.py". The latter uses the former and gspread to get and display the name of the first sheet of your user's workbook. 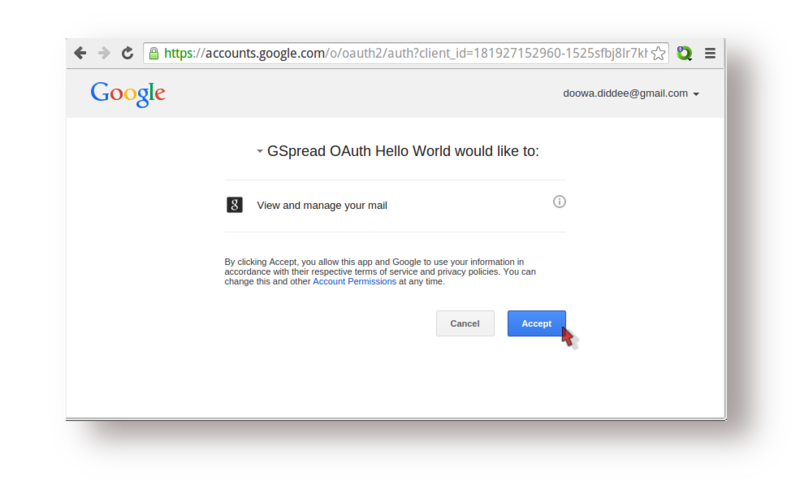 Authenticate and self-authorize GMail SMTP use. Get permission on other user's spreadsheet. I don't want to be accused of wrecking anyone's system. Python is integral to the workings of Ubuntu and altering it willy-nilly is a bad idea. Virtual environments protect you from that. First we check what the Python execution path looks like normally. It contains directories like /usr/local/... and /usr/lib/... etc. That's what we do not want to mess up. The scripts create new environment variables and aliases that will be available on next log in. To get them immediately, run this . . .
We create a shadow directory holding the secluded execution environment for our project. Check it again. The (hiOAWorld) prefix should be gone, and you should see the original Python system path. Check it again. The (hiOAWorld) prefix should be back again. The application has a few external dependencies. Now is the time to go get them. 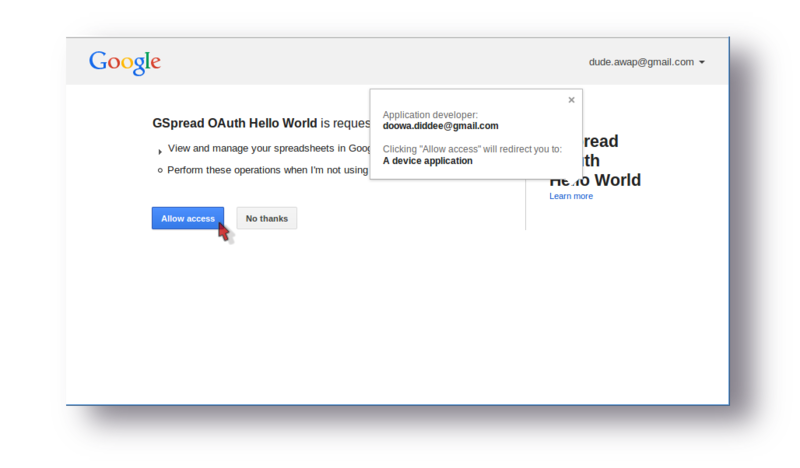 The included utility loadGoogleJSON.py reads Google's OAuth credentials out of a JSON file that you have to download from Google's Developer API console. 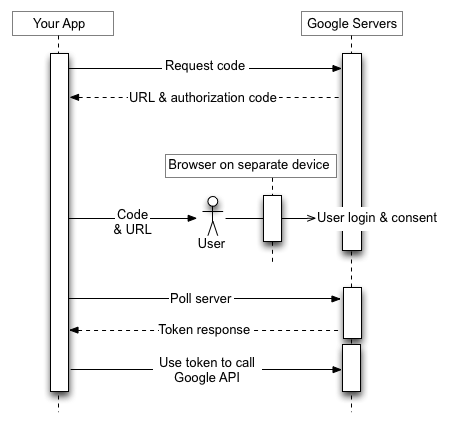 Follow these steps for Obtaining Authentication Credentials from Google's new style API Console. You will need to save the file "client_secret_xxx...xxxcom.json" in the directory "~/disposable/gspread_HelloOAuthWorld". I have several dummy GMail accounts for testing purposes. I'll use one as the SMTP account holder and the other as the user whose Google Sheets we need to access. For now we'll us the first one to get our email transfer capability working. The first time you run it, it will ask for all details. It remembers them so that you have less to do on subsequent operations. No valid token pair found in working_parameters.py. Will run the wizard. authorize this program to use Google's email resender in your name. Copy that url into a browser, follow the steps, then get the verification code and paste it into the field of the prompt "Enter verification code:"
"User login and consent" step . . .
"Authorization code" response step . . .
# Appended automatically . . .
Now that we can send email through Google SMTP, we can request access to Google products of other users. Sending permission request . . .
. . permission request sent! 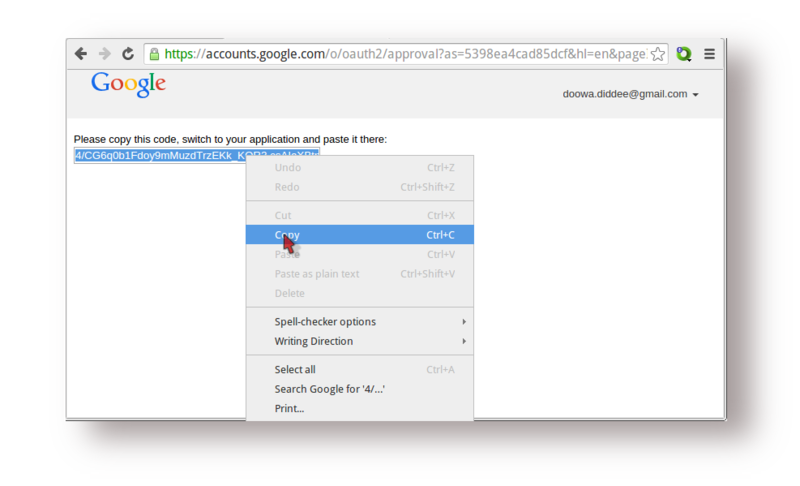 ***  You have to verify that you DO allow this software to open your Google document space. ***  Please check your email at some.other.user.name@gmail.com. ***  The message, [doowa.diddee@gmail.com wants permission to access your Google Spreadheets with "gspread".] contains further instructions for you. Your user will approve by clicking the blue button . . . If your user takes longer than 30 minutes you'll have to try again. A simple example file called gspread_HelloOAuthWorld.py was written to disk. It lists the names of the sheets in the target spreadsheet. As a freelancer, often collaborating with my clients on their spreadsheets, and interconnecting them with other data sources, I find my self needing the above functionality quite frequently. Please let me know if you find them useful too. I am very glad you found this helpful. You deserve to know, however, that I have actually dropped trying to do anything of significance on Google's free offerings. Having had my work broken several times by silent changes, I no longer dare to trust them.